Inshore Habitat Project - The Resident Community News Group, Inc. | The Resident Community News Group, Inc.
Anglers who spend time looking at depth monitors while running around the ocean understand that subtle to drastic changes in depths and structure along the bottom are great places to target. These areas attract and host a large variety of marine life. And in turn provides structure and food for many different species of fish. If ledges and structure attract fish in the ocean, will this work inshore? Payton Scheppe, Coastal Conservation Association (CCA) volunteer, says an effort has been underway for several years, and that our Jacksonville waterways are moving closer to the reality of hosting artificial reefs that can be enjoyed by all. In the fall of 2011 an initial meeting was held at the Marine Science Facility at Jacksonville University and CCA was attracted to the goal of a habitat project in the St. John’s River for the purposes of enhancing the food chain and biological diversity. This habitat will provide shelter to juvenile species, increase fish populations, and provide sustainable recreational fishing opportunities. Present at the meeting were representatives of the City of Jacksonville, Florida Fish and Wildlife Commission, Florida Department of Environmental Protection, Jacksonville Offshore Sport Fishing Club, TISIRI, JU Marine Science, and Jacksonville Chapter CCA. Jacksonville had pioneered offshore reefs beginning in the 1950s but no project of scale had ever been done inshore locally. The meeting had a positive impact on the City of Jacksonville. Jody McDaniel, Jacksonville planning and grant coordinator, and the administration of COJ were supportive of the concept and took on the responsibility of permitting from the State of Florida regarding the identified submerged lands. The City of Jacksonville has received this permit along with the necessary Federal permits. Before construction could begin, several other government agencies had to do their due diligence and approve the project. The Army Corps of Engineers and the Coast Guard have completed reviews to their satisfaction. The last issue is endangered species protection. The sites that CCA were looking for had to have specific characteristics for this effort to be effective. Of four possible sites, two were selected that are near downtown and sufficiently removed from the shoreline. They are located 3/10ths of a mile south of the Fuller Warren Bridge and east of the channel. The sites are depressions in hard bottom with adequate scour to prevent excessive sediment accumulation and are roughly 40,000 square feet each, or 200’ x 200’. The City of Jacksonville has mapped the locations with the Sheriff’s Department sonar and JU has taken bottom samples. The Jacksonville Chapter of CCA has disclosed the site locations as the following: Latitude: 30.17.973N Longitude: 81.40.290W and Latitude: 30.18.484N Longitude 81.40.026. Many large vessels use these waterways too, and the committee and city have taken steps to ensure there is no risk of running aground on one of these sites. The habitat material will have an average elevation of four feet or less which is comfortably less than the increased depths of the depressions. Rubble will be distributed in a low as opposed to a stacked profile. Other research has been taken into account to ensure the strategic placement of the artificial reef will be done correctly and cost effective. In May 2013 a meeting was held to discuss habitat design and deployment. The conclusion was that broken concrete with dimensions between two to four feet would provide an advantageous habitat in regards to gross surface volume. Concrete rubble has significant cost advantages over manufactured habitat, such as reef balls. Companies are stepping in and donating valuable resources to the project. Robert Hays, North East Florida District Manager for Vulcan Materials Company has offered to donate the 50,000 cubic feet of concrete rubble that will be used for the site. Once the project begins, the rubble will be taken to the sites. Deployment will be done by barge and will be in a manner allowing open areas within the habitat. Separation between concentrations of material would be irregular but generally in the range of several feet. Fisheries research indicates a benefit to scattered as opposed to solid material. Initial estimates for transporting and deploying the barge load of material shows it could cost as much as $25,000 for each site. Coastal Conservation Association National (www.joincca.org) has committed $30,000 for the project and that money has already been received. The Jacksonville Chapter of CCA Florida (www.ccaflorida.org) has committed to raise money as well. But the work won’t stop when the construction is completed. The city of Jacksonville is committed to ensuring the project has an ongoing positive impact. They will not issue any additional permits associated with an inshore-habitat project until Jacksonville University has the opportunity to do a post-project research exercise for 3 years once the habitat is put in place. Rock samples from around the Epping Forest area will be studied and used as a baseline in the ongoing research. The funds needed for this study could run $2,000 per year, and has been committed by the Jacksonville Chapter of CCA. CCA is a 501(c)(3) organization founded in 1975 and serves as a national voice for recreational marine fishermen. CCA has 100,000 members. CCA Florida was founded in 1985 and represents 10,000 members. Tax deductible contributions may be made to either CCA Florida (memo: Jacksonville Habitat Project), PO Box 568886, Orlando, FL 32856 or City of Jacksonville (memo: Contribution for Artificial Reef Fund), Attn. Cheryl Brown, Jacksonville City Council, 117 W. Duval St., Ste. 425, Jacksonville, FL 32202. The Coastal Conservation Association (CCA) is holding its 23rd Annual Banquet and Live Auction on Nov. 7 at The Garden Club in Riverside. Tickets are $85 per person, or $150 per couple and include open bar, dinner and one year CCA membership. Silent auction and raffle begin at 6 p.m. and dinner and the live auction at 7:30 p.m. CCA is a grassroots organization that is committed to conserving and protecting Florida’s marine resources and serves as voice for recreational fisherman. 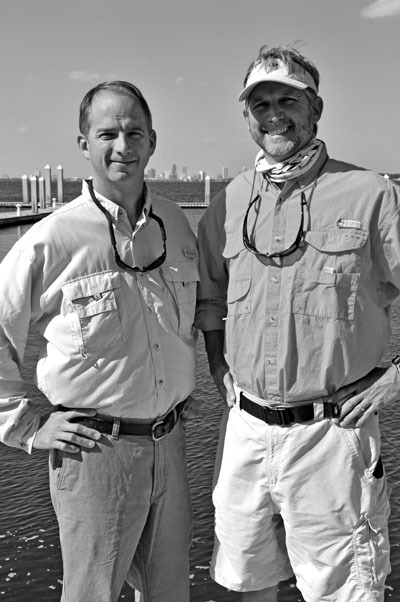 Locally, they were a driving force behind the new inshore habitat project near San Marco, south of the Fuller Warren Bridge. This habitat will enhance the food chain and biological diversity, give shelter to juvenile species, increase fish populations, and provide sustainable recreational fishing opportunities. For more info visit www.CCAFlorida.org or call Greg Craddock at (904) 982-6104. The Creek Wars Triple Challenge Fishing Tournament, presented by Firehouse Subs, will be held on Oct. 19 at Beach Marine. Proceeds will benefit the Firehouse Subs Public Safety Foundation and the Guy Harvey Ocean Foundation. The Public Safety Foundation supports first responders with life-saving equipment, funding, training and resources while the Ocean Foundation supports programs to encourage conservation and best management practices for marine environments. A mandatory Captains Meeting will be held at Strike-Zone Fishing (courtyard) on Oct.18, 6-8:30 p.m. Early register by Oct. 11 for $125 per boat and you earn a chance to win a Yeti 35 quart Tundra Cooler. The tournament pays out over $9,000 in winnings and prizes. For more information, registration and sponsorship opportunities contact Kirk Wurster, (904) 483-6212 or visit www.creekwars.com.